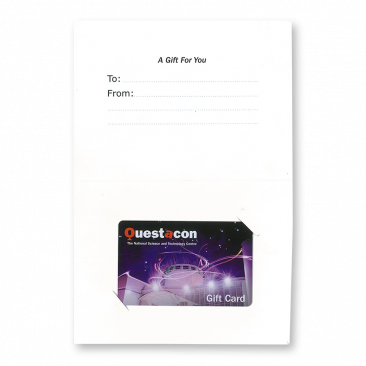 Let us take care of finding that perfect gift for you with a Questacon Gift Card for your loved one! With a gift card, they can purchase a membership to visit and revisit the National Science and Technology Centre over and over again. Choose your membership package value in the drop down menu below. Step 1: Choose a membership value for the gift card. Click on 'Membership Pricing' tab for more information. Step 2: Add to cart and leave a personalised message in the 'Customer Notes' section. See below for more information. Step 3: Choose the delivery address. Step 4: Once the recipient has received the gift card, they can redeem it for a membership any time within the next 12 months. The Questacon Gift Card comes professionally presented in a plastic sleeve with an image of Questacon on the front. To make your gift even more special, we can easily personalise the gift card for you if you would like us to send it straight to the recipient. At checkout, simply fill in the 'Delivery Address' with the recipient's information, and then leave a personalised message in ‘Customer Notes’ and we will write this on the gift card for you before we post it. 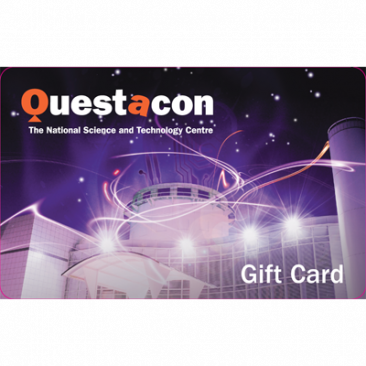 The Questacon Gift Card can only be redeemed at the Questacon Shop and the Questacon Ticket Desk, and is not redeemable at the Questacon Shop online. What are the benefits of becoming a Questacon member? The Q Club Member’s discount and Q Shop discount codes do not apply for Questacon Gift Card purchases. Gift Card value will be determined by value paid. For full terms and conditions please visit www.questacon.edu.au/gift-card-terms-conditions. Key Conditions of Use: Treat this card like cash. This card is not refundable and cannot be redeemed for cash. Lost or stolen cards will also not be replaced or refunded. This card is valid for 12 months from date of purchase and expires on the date specified on the card. Any unused amount on this card will not be replaced, refunded or credited. Questacon reserves the right to void any gift card that appears to have been defaced, mutilated or altered, except where otherwise required by law. This card is redeemable at Questacon Parkes for purchases at the Questacon Shop and Questacon Ticket Desk only. This card is not redeemable at the Questacon Shop on-line. Questacon reserves the right to vary these Terms and Conditions at any time. Full Terms and Conditions (including any changes) are available at www.questacon.edu.au/gift-card-terms-conditions or by calling 02 6270 2800. Children under 4, and who are not turning four within the membership year, get free entry and do not need a membership. * Additional children are for the fourth, fifth, sixth, etc. child in a Family or Single Parent Family category. Additional children cannot be added to Individual or Concession categories. ** To be eligible membership must be renewed within one month after expiry.